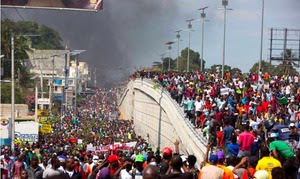 As you may have read in the news, the political and economic instability in Haiti has escalated. Corruption claims and a new fuel shortage have led to nationwide protests and demonstrations demanding the resignation of president Jovenel Moïse. Some protests have turned violent and many people are afraid to leave their homes. Schools and businesses have been closed since last Thursday, and there has been no electricity supply for days now. Markets are closed, and some food suppliers have even shuttered their warehouses.So far, Na Rive has been able to draw from their emergency food sources. But with fuel so scarce and so many businesses closed due to the protests, inflation is skyrocketing. Which means many more people are not able to feed their families and are in need of help.Please help us keep the children and families of Ti Plas Kazo from going hungry during this time of emergency. Make a donation today. The cost of food and school supplies are up at least 40% from just last week, which is magnifying the suffering throughout Ti Plas Kazo and all of Haiti. The need for donations is urgent. Let’s show the children and families in Ti Plas Kazo we care and will continue to stand with them in these difficult times. Indeed, it is during times like these that we see the strength and impact of our partnership with Na Rive and we’re grateful to have such a direct way to respond. Thank you for your support and for holding Haiti in your heart. I always enjoy these last few days of the holiday season, when I can savor quiet moments with family and friends, and set my intentions for the coming year. As 2019 approaches, I hold hope in my heart for Ti Plas Kazo, and for all the children in Haiti. The challenges are great, but so is the incredible spirit and determination of our Haitian friends. If you’re still deciding on your year-end giving, please consider making a donation towards food, education and hope for the next generation. Every dollar you give represents possibility: a hot meal, school supplies, a teacher’s salary and so much more. Possibilities that can only happen with your help. And don’t forget there are many ways to give. You can make a donation online, send a check, donate stock, or give while shopping through Amazonsmile, goodshop or Giving Assistant. On behalf of What If, our Haitian partner, Na Rive, and the children of Ti Plas Kazo, we thank you for your generosity and wish you a happy, healthy New Year!